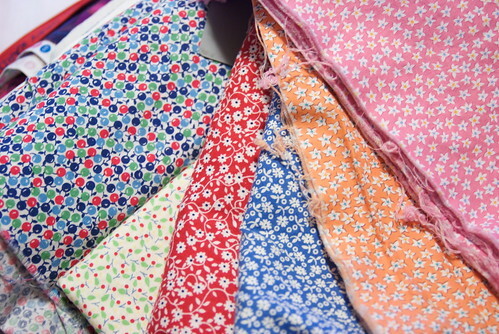 There are not quite enough completed hexagons to form a Grandmother's Flower Garden quilt, so I went to Atlanta and shopped for some 1930s reproduction fabrics that would blend well in color and design with these fabrics. I believe I will need to tea-dye some of them to speed the appearance of aging; the fabrics look right, but they look too new. 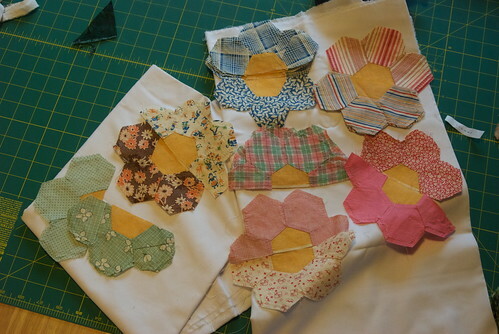 I am leaning toward carefully dissecting a few of the 'flowers' into their individual hexagons, and mixing them in with the new fabrics, to facilitate blending -- thus the name. Bonus? 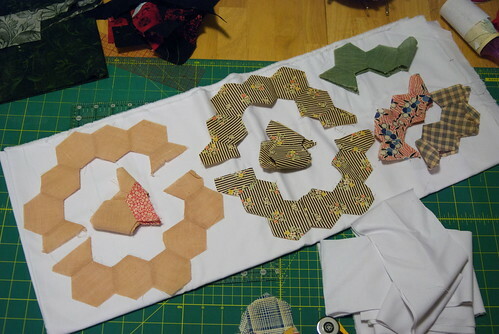 These pieces exactly match a 2" hexagon quilt template set I already had. 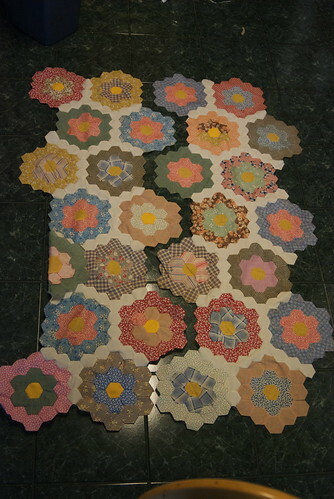 I don't have to construct templates ... just cut a lot of blank hexagons. Normally I'd start a new entry for this note, but I think I'd rather put everything together here. I finished sewing the quilt top today. I have an afternoon reserved on the longarm quilter six days from now; getting this quilt top quilted and stabilized will be my next Saturday. 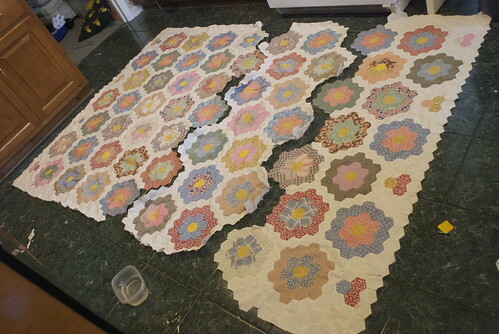 I think this quilt will fare reasonably well, once it's all bound together. I was hesitant to handle the fabrics because the feed sack fabric was coarsely woven in places, but as I got the pieces together and surrounded with muslin, I started getting more confident about the future of these pieces. At first, I worried if they'd stay together long enough to get sewn, but once the raw edges were bound off, I realized they were pretty sturdy. I wasn't interested in taking chances, though. 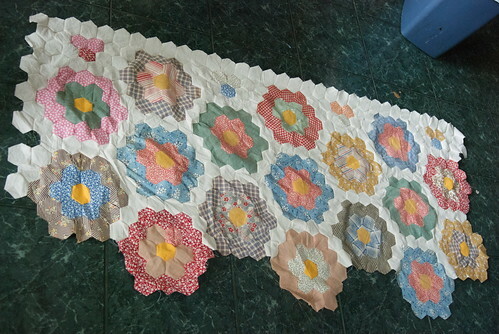 Instead of leaving the zigzag edges sometimes seen on Grandmother's Flower Garden quilts, I filled out all four sides with hexes made of plain muslin. I didn't want any of the hexes taking on the extra stress of being attached to the binding. See, little ones? My plan. Mind if I froth at the mouth? The red-and-blue bubbles are the backing fabric for the quilt. I'll bind it in the bright red I used in a few hexes on the quilt top, for a sense of continuity. If you look closely, you'll recognize all of those fabrics, save the backing fabric, as having made a few appearances in the quilt top. Overall, I'm pleased. I like knowing these pieces will finally see the light of day. They deserved to be used and loved and jumped on by little kid feet, not set aside in a pretty box for a few more decades until someone else came along and said, "These should be made into a quilt." They've waited a long time to come into the light. I hope they love it, now that they're here. amazing. i'm sure the great-grand-aunt or whoever started this is totally impressed with your work. I know ATL isn't exactly in your backyard, but seeing as you do go there for fabric shopping, i thought I'd mention.. I have an excellent long-armer in Marietta, just north of the city. she blogs at http://piecefulkwilter.blogspot.com, and I cherish (and show off) everything she's ever made for me. Keep it in mind for the future, ok? That's good info, actually. Seven Brides For Seven Brothers will need a sure and creative hand when I'm done assembling it, and I am open to suggestions for someone who would take this strange and new layout and love it as much as I do. I think a standard meander or pantograph would be a waste, but I'm equally unsure of what to do in its place. 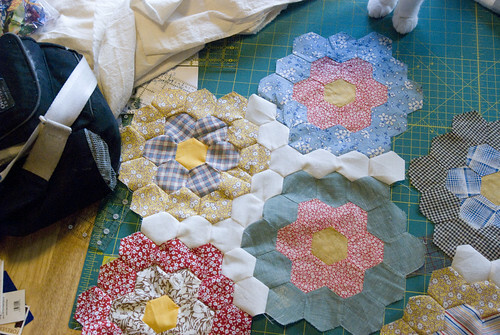 I'm whimpering a little at the thought of re-quilting Remixed. There was a huge, awful, dreadful snafu in the quilting process - I got partially through quilting on the longarm quilting machine locally and (I kid you not) the machine blew three fuses within a five-minute span. 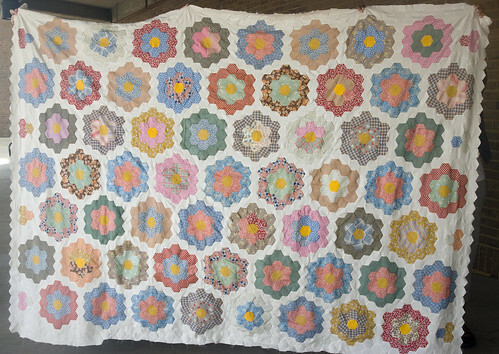 I couldn't complete the quilt, and I felt like I'd wasted about $60 in rental fees. After I had a couple of weeks to sulk about it, I realized I wasn't happy with my work, and should treat the blown fuses as an opportunity. I kept my frustrations in mind as I tried rearranging my kitchen table setup to see if it was even possible to quilt a full-sized quilt on my machine at home. It turns out that if I'm careful, I can indeed do it. I think it likely that I will re-quilt Remixed from the start, using a less contrasting thread color and a more careful seam line echo pattern. I'm not happy about the extra work, but when this quilt is done, I want to be able to hand it to Hallie and say, 'it was done, and done well.' Right now I can't say that. This is a baaaaad hobby for perfectionists! I found you via littleshika.